I figured for those who have been following along it's time for a personal update.. This week was a quiet one for me as far as having to go out and run a lot of errands and I"m thankful for that. I don't have a lot of energy to begin with so when I can stay home I'd much rather do that and be able to get whatever I need to do at home done and then be able to relax. Having to run errands and take care of things at home takes a lot out of me physically. This morning I started my day off with reading the devotion for today from "Jesus Calling", fed all the dogs and then I finally got my car which I love ( 2012 Dodge Avenger) to the dealership for a much needed oil change and had the air pressure in my tires evened out. I figured I was going to be there forever. So I checked in at the service desk and then waltzed over to the waiting area where they have chairs, a TV, vending machines and an area for little children to color and read books. While there I settled in and spent some time talking to a nice gentleman about.. cars.. Yes cars. I have loved cars since I taught myself to drive when I was 15 , I always worked in the auto industry when I was able to work, I even rebuilt an engine with some help when I was 17. I thought to myself how nice it is to talk to someone while I wait and who also has the same passion for cars as I do. Before I knew it though, my car was all done and it had only been about a 20 minute wait. I was grateful. After that, I had to stop at the IGA to pick up some milk and tinfoil and I was on my way home. I left the house this morning at about ten minutes after ten and I was home before 12pm. Not bad.. Thank you God for answered prayers. Mr L. is continuing his in home rehab. He's been learning how to walk upright again. He has to retrain his back, stomach and leg muscles to hold him upright again after being hunched over for almost three years and it's going well. 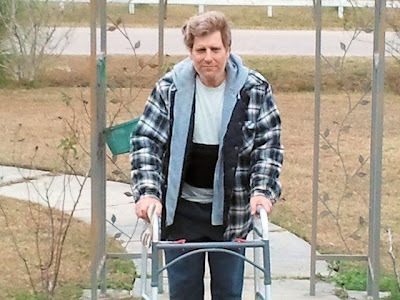 His physical therapist will only be making one more visit to the house a few days after Christmas where she will then have him start holding himself up with no walker. That is her last visit to the house as our Insurance will not pay for anymore in home visits and then it will be onto out patient physical therapy at the local center here in town. That won't happen though until Mr L goes back up to Duke University Hospital on January 2nd for his first follow up appointment with his surgeon at which time we are hoping he will give him a physical therapy schedule and we are praying that everything will look great on the X-rays. Please keep that intention in your prayers if you would be so kind.. Here is Mr L this afternoon coming back from his walk fighting the wind at the same time.. He looks grumpy here but he's not.. His muscles were fatigued and the wind was whipping in his face plus, yeah, he does need a shave..
As Mr L was making his way out the front door with me in tow behind him I got such a nice surprise!. I looked on the front stoop and there were some beautiful! 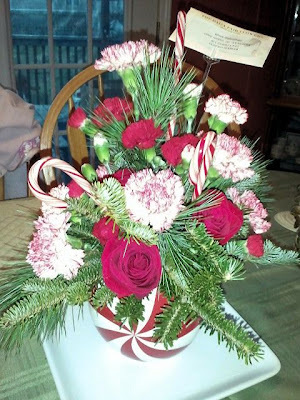 Christmas flowers for us. I absolutely love this arrangement and I adore the vase they came in. They are from a woman I call "my other mother". One day, with her permission I will explain that to you. Thank you mom ! We love them and they look beautiful in our dining room! The weather here in my part of South Carolina has been just crazy. One day it's cold and the next day I have my air conditioner on. Yes, yesterday afternoon it got to 80 degrees inside my house and I couldn't take it any longer so I popped the air conditioner on for a little while. Now tonight we are expecting showers, maybe thunderstorms and gusty winds tonight and tomorrow which is supposed to rush in some cold air. Unfortunately for me, it can't get cold enough here. I would like about 25 degrees and LOTS of snow on the ground but that's not going to happen here anytime soon..
Oh and one last thing. For those worrying about the world ending tomorrow because of the Myan Calendar. You'd be best served to trust in Jesus Christ and what he tells us which is , Matthew 24 : 36 "No one knows about that day or hour, not even the angels in heaven, nor the Son, but only the Father." So don't get yourself all upset, God willing we will all be here tomorrow probably doing the same thing we did today. As for my physical condition, what can I say.. I am very tired these days. With Mr L recuperating there is not much he can do right now except walking and sitting for small intervals at a time which of course puts all the chores on me. I don't mind them for I married him for better or worse, in sickness and health but with my own health being poorly, it does get rough and there are a lot of days that I don't want to get out of bed but I do, and there are a lot of days where I just want to go back to bed but can't. So, I am doing what I always do. Giving everything to Jesus, holding tight to Him and praying lots. "Philippians 4:13" "I can do all things through Christ who strengthens me"